The Rebel Sweetheart. : Free Seminar | Juicing for Health, Beauty and Wellness. Free Seminar | Juicing for Health, Beauty and Wellness. SpeedyCourse Philippines has teamed up with Hurom Slow Juicer to kick off the summer season with a FREE health and wellness seminar - Juicing for Health, Beauty and Wellness. As the juicing trend continues to make waves, the increasing number of recipes, ingredients, “diet” menus and contrasting opinions on juicing leave many people with the question: "How is juicing really beneficial to our health?" In this seminar, Maria Socorro 'Cocoi' M. Andal, Naturopathy Practitioner and Health & Wellness Advocate, will talk about what our bodies need as true nutrition, its sources and how fresh fruit and vegetable juicing can help meet these nutritional demands. She will also touch on detoxification, an essential process to losing weight the natural and healthy way, helping to recover from ailments, as well as keeping the immune system strong and fit to prevent diseases. Using Hurom Slow Juicer, Ms. Cocoi will also discuss and demo various juicing recipes for multi-dimensional needs. Attendees will get a chance to ask questions during the seminar. 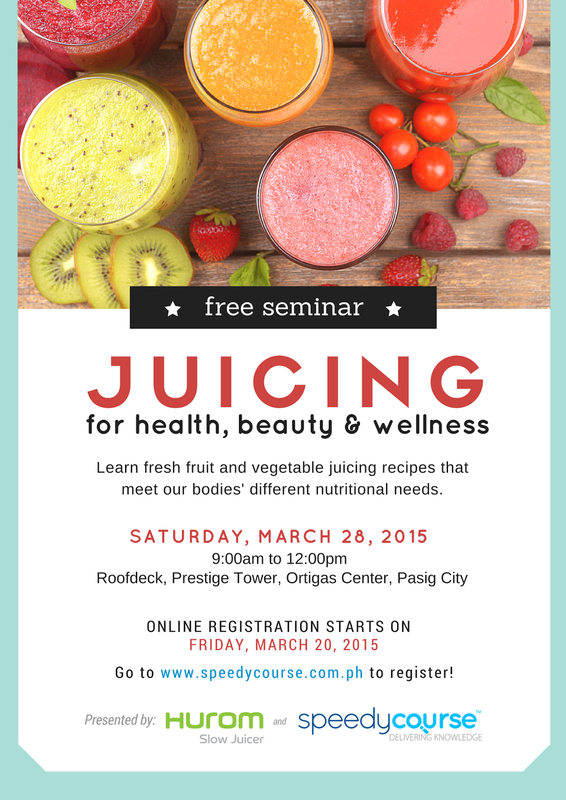 The free juicing seminar will be held on March 28, 2015 from 9:00am to 12:00nn at Roofdeck, Prestige Tower, F. Ortigas Jr. Road, Ortigas Center, Pasig City. Online registration starts on March 20, 2015! To register, visit www.speedycourse.com.ph. The Hurom Slow Juicer is a juice extractor that uses the world’s first patented technology LSTS, which allows juice to maintain its natural flavor, original color, vitamins, enzymes, and nutrients. For more information about the product, you may call Zinven International Corp. through 926-7782 or 926-7786, the exclusive distributor of Hurom Slow Juicer. Thank you so much for sharing this. I think it's great that there is going to be a free juicing seminar. I can't wait to see how that goes if you are attending. I could benefit from a seminar like that. It's something I haven't dipped my toes into at all yet, but I'm interested. It sounds like a very worth wile seminar. I'm curious about juicing, but it does get overwhelming with all the different products and menus out there! This is a great idea to give people a good place to start! I would definitely want to take a seminar if I was getting serious about it. Best to be in the know before you move forward, definitely. I have been hearing about juicing now for quite some time. It seems like a healthy and easy way to lose weight. I have heard so many amazing things about juicing and the incredible health benefits of it. This is such a great subject for a seminar! I love smoothies and healthy juices. This sounds good! We have been juicing for a while. Great for health. This sounds like a great seminar. I really would love to know how to make healthy juice and smoothies. I totally need to learn more about juicing. I even have a juicer! I am starting to get into juicing myself and I would love to hear more about it. So nice of you to give out information for free. This sounds like an awesome seminar indeed. I have been thinking about getting a juicer for a while now. Thanks for sharing. I have always been interesting in juicing. This would be fun.